One bummer about Valentine's Day being on a weekday is that it's not always easy to plan a fun meal at home (if that's what you prefer, like me!). Especially a spectacular dessert to relax with after dinner, or after the kid(s) are in bed. But it's V-Day, and of course you want something special. 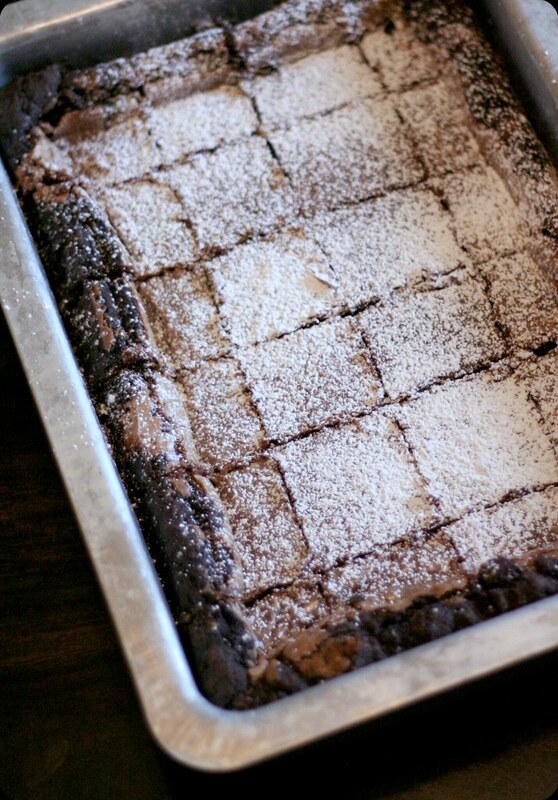 If you're wanting to make something for tomorrow and just don't have a lot of time, I suggest trying out this Nutella Gooey Butter Cake. It's rich and decadant, like a good Valentine's Day dessert should be, but it's easy peasy! The use of a store bought cake mix helps with that. It does take awhile to bake and cool, but it's pretty hands off. Let it cool while eating dinner and bathing the little ones! Heat oven to 325 degrees and lightly grease a 9x13" pan. Using an electric mixer, blend cream cheese, 2 beaten eggs, nutella and vanilla. Then slowly add powdered sugar and beat until smooth. Spread filling over cake batter, and bake for 40-45 minutes/ Do not overbake, the center should still be a little gooey. Cool and dust with powdered sugar on top. You had me at Nutella. Sounds like a great dessert option when you're pressed for time! Whoa. Normally I'm a purist with my gooey butter cake, but this just looks and sounds INSANE. Might be my baking project for my day off on Monday!